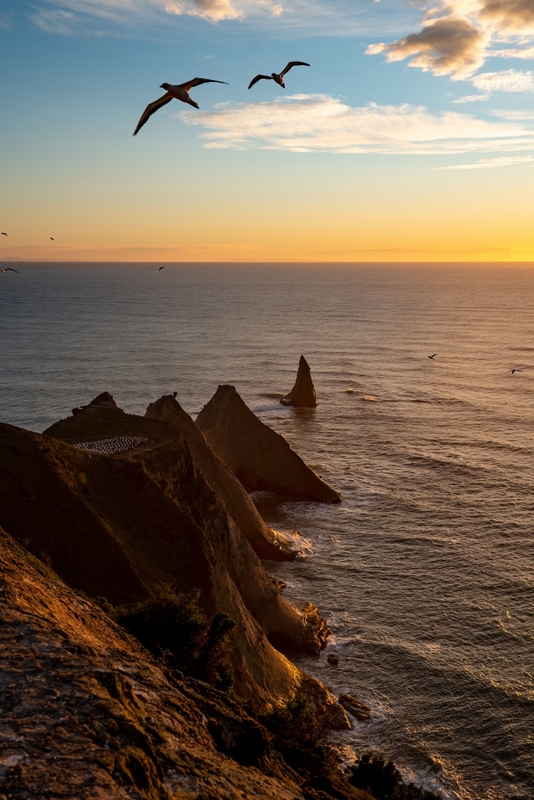 The East Cape of New Zealand is the first in the world to see the sunrise each day. 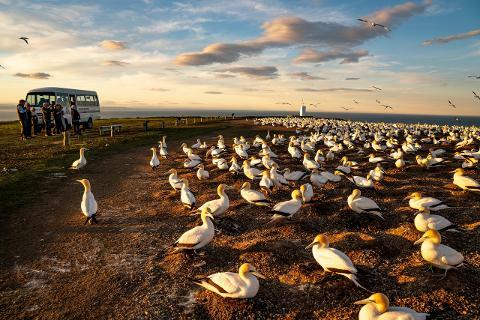 Enjoy a unique tour to Cape Kidnappers and watch the sun rise over the gannets. 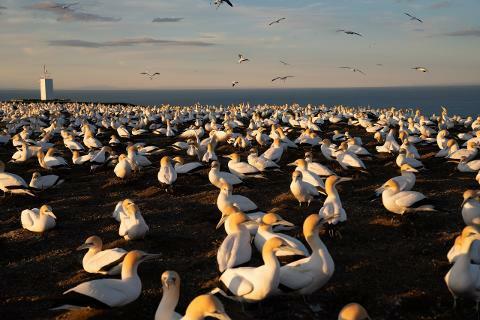 Take an unforgettable tour to this iconic site – the largest accessible mainland gannet colony in the world! 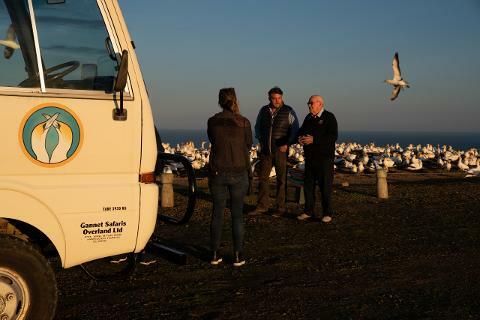 Your 3-hour personal tour will take you overland through Cape Kidnappers Station, a working farm of approximately 2,500 hectares with a fascinating history. In addition to beef and sheep farming the station boasts a 200-hectare conservatory protected by a predator proof fence running from coast to coast across the promontory. The conservatory hosts introduced Kiwi and Tuatara along with a wide variety of native birds and wildlife which had previously been wiped out by predators such as stoats, weasels, opossums etc. There is a luxury lodge on the farm with a privately-owned world class golf course. 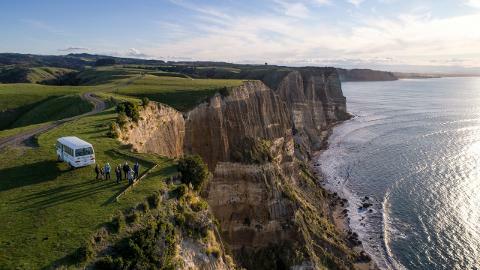 A cliff-top stop en route to the colony provides spectacular views across Hawke Bay to Napier and the distant Mahia Peninsula. On arrival at the colony you will be mesmerised by the spectacular birds with their eye markings and golden crowns. 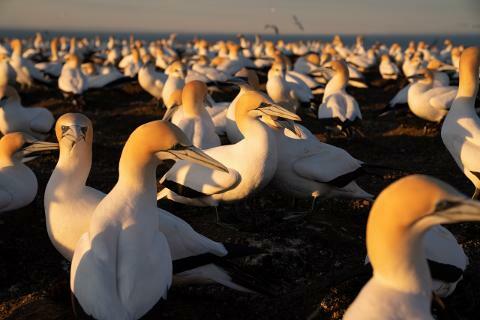 From within just a few feet of the adults and nesting chicks see these remarkable birds preening themselves and performing their courtship dance ritual. On the sunrise tour a light breakfast is supplied with freshly brewed coffee. This tour only runs in the months of January and February and only on Saturdays - other times on request.